The engagement ring and wedding band that comprise this 0.50 carat engraved heart wedding ring set in 14K white gold work together to create an unmistakable celebration of your affection. These two rings are both adorned with meticulously-carved hearts, as well as with petite milgrain edges, to create a look that's both sophisticated and sweet. A half carat round diamond rises regally from the engagement ring, providing this 14K white gold pair with sparkle as it's upheld by a four-prong setting. 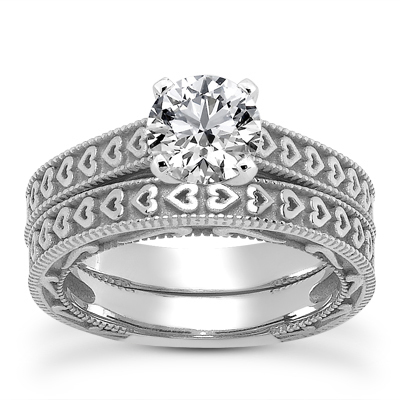 A 0.50 carat diamond is set in an engraved heart bridal ring set in 14K white gold. Apples of Gold Jewelry guarantees the 0.50 Carat Engraved Heart Wedding Ring Set in 14K White Gold to be of high quality and an authentic engagement ring with real diamonds, as described above.